Sterile neutrino detections: dark matter candidate? What is dark matter made of? A postgraduate student giving a talk at NAM2015 today may have an answer in the form of a mysterious spectral line in the X-ray region. Normal, ‘everyday’ matter that makes up stars, planets, gas and dust is something that astronomers can easily detect. It either gives off, reflects, or absorbs light, electromagnetism or radiation. Dark matter’s much more shifty. It’s completely invisible, yet comprises 84.5 percent of all the mass in the Universe. Scientists only know of its existence because of the gravitational effect it has on its environment — even lensing light from distant galaxies by bending the spacetime around it. Just as the normal matter around us is made of subatomic particles (protons, neutrons, electrons, etc), so scientists surmise, must dark matter be also. The current model favoured by many scientists for dark matter involves ‘Cold Dark Matter’ (CDM) particles, which are slow-moving compared to the speed of light. But no dark matter particle has ever been detected. However, in a talk at NAM2015, Sownak Bose from Durham University’s Institute for Computational Cosmology (ICC) presented new predictions for a different sort of candidate particle: the sterile neutrino. And it may have been detected in an X-ray spectral line. Simulated image comparing Cold Dark Matter (CDM) model with one based on sterile neutrinos. On the left is a visualisation of the Milky Way environment in a Universe dominated by CDM; on the right is the same object seen in a sterile neutrino dark matter Universe. While there are thousands of satellite galaxies in the CDM model, their abundance is greatly reduced in the sterile neutrino case. The net result is a ‘smoother’ dark matter halo in the sterile neutrino case, compared to the ‘lumpy’ CDM one. The simulations were created at the Institute for Computational Cosmology in Durham as part of the Aquarius supercomputing project undertaken by the Virgo consortium. Image credit: M Lovell, ICC, Durham University. Do cosmic jets live in dark matter ‘ponds’? Cosmic jets — jets of material from active galaxies travelling close to the speed of light, may correlate with dense regions of dark matter in the Universe. A team of PhD students presented results at NAM2015 today that show how the Cosmic Microwave Background Radiation (CMB) can be used as an indicator to test for such a correlation. 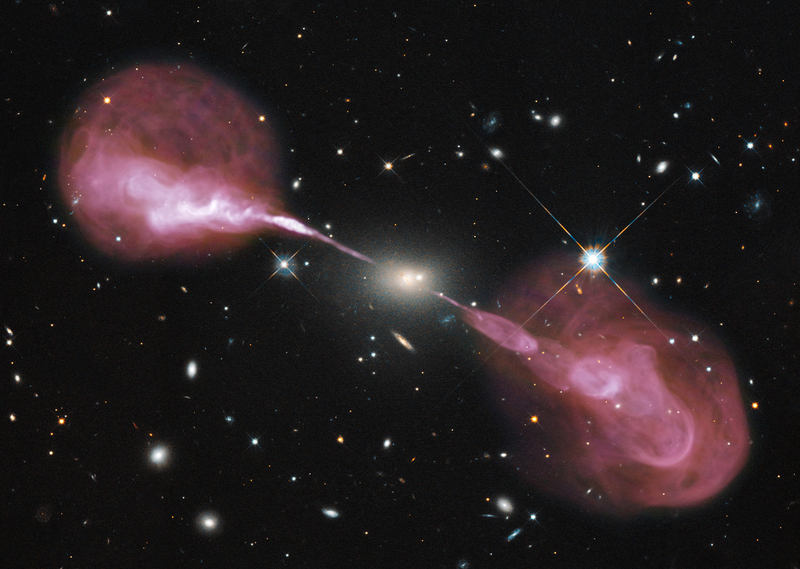 Active galaxy, Hercules A, showing extensive radio jets. Image credit: NRAO. Cosmic jets exist in active galaxies, many of which have supermassive black holes in their cores that are millions to billions of times the mass of our Sun. The infalling material spiralling towards a galaxy’s black hole forms an accretion disc that gets hotter as it gets closer to the black hole. Eventually the material becomes a super-hot plasma that radiates brightly in X-rays, ultraviolet, visible, infrared and radio wavelengths. Some of this charged plasma can is then channelled along powerful magntic fields at enormous speeds out of the galactic disc. These cosmic jets are easily spotted by astronomers. Dark matter, however, is completely invisible. It doesn’t emit, reflect or absorb electromagnetic radiation of any kind and is only detectable by its gravitational effects (see also the previous story for today). This gravitational property is what enables dark matter to attract normal matter into ‘ponds’ that may eventually become galaxies. Indeed, many scientists think that this is how major galaxies came into existence — though this is still an intense area of research. And as of yet the nature of dark matter is completely unknown. 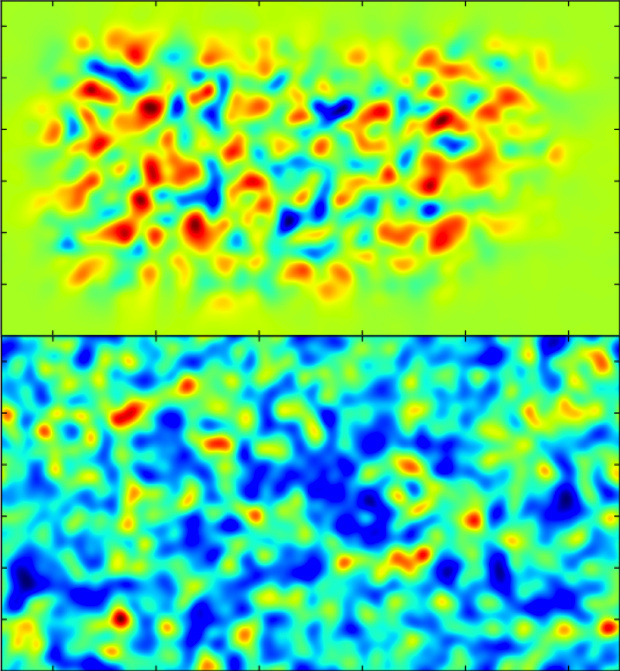 Sample CMB lensing map (top) and radio overdensity map (bottom). Image credit: University of Oxford, UC Berkeley. 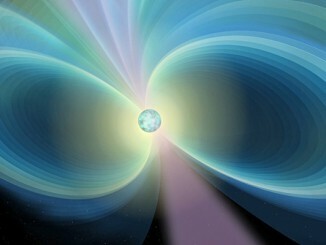 The CMB is the oldest, most distant radiation detectable. It originates from a time, just 300,000 years after the Big Bang, when the Universe changed from being hot, dense and opaque, to being transparent. As such, CMB photons traversing the Universe should be affected by certain things lying in their path. Speaking to Astronomy Now, lead author Rupert Allison of the University of Oxford says, “We think that the really dense regions of dark matter are where we should see more of these cosmic jets.” The reason for this is that cosmic jets are indicative of supermassive black holes and thus, major galaxies. Such galaxies are expected to form inside dark matter halos. Along with Dr Sam Lindsay of Oxford University and Dr Blake Sherwin of UC Berkley, Allison looked for distortions in a map of the CMB using data from the Atacama Cosmology Telescope and the Very Large Array’s First Images of the Radio Sky at Twenty centimetres. Such distortions are giveaways of high mass regions, where large scale gravitation is strong. Einstein’s Theory of General Relativity predicts that strong gravity will distort spacetime, and thus the path of light, or other radiation — almost as if there was a lens in the way. The team saw just such distortions. When compared with a map showing high-than average concentrations of cosmic jets, there was a correlation. “We can estimate the size of these dark matter halos and they’re around 10^13.6 solar masses in size,” says Allison, who is excited by the prospects of more robust data with the Square Kilometre Array; the largest radio telescope array ever-made and currently under development. As Allison says to Astronomy Now, “What we’re expecting to see is how these jets and their galaxies change over the evolutionary history of the Universe.” The existence of a correlation is just the beginning. Until now, scientists have determined the mass of stars, planets and moons by studying their motion in relation to others nearby, using the gravitational pull between the two as the basis for their calculations. However, in the case of young pulsars, mathematicians at the University of Southampton have now found a new way to measure their mass — even if a star exists on its own in space. When constructed, the Square Kilometre Array (SKA) will be the world’s largest radio telescope. 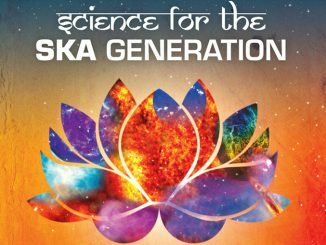 The SKA project’s 2016 science conference, “Science for the SKA Generation,” has kicked off in Goa, India. Some 200 astronomers from around the globe have travelled to attend the week-long conference. Astronomers have used data from NASA’s Chandra X-ray Observatory to study the properties of dark matter, the mysterious, invisible substance that makes up a majority of matter in the universe. 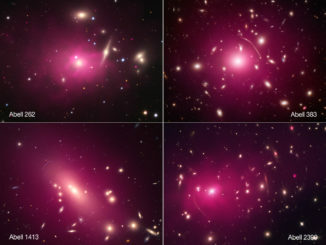 The study, which involves 13 galaxy clusters, explores the possibility that dark matter may be more “fuzzy” than “cold,” perhaps even adding to the complexity surrounding this cosmic conundrum.